Finally, after looooonnnggggg 9 years this frog prince of mine was finally framed. 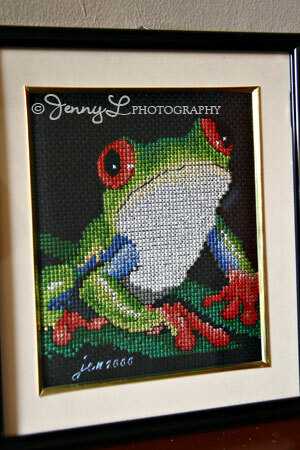 I actually cross-stitched this frog on year 2000 and I have been meaning to have it framed for a long time. I was cleaning my drawer last week and this once again and thought that I really need to have it framed becaused it is already collecting dust so one rainy afternoon I went to the frame shop. This is my last cross-stitched project that I have done and I don't think that I will be able to get my hand in cross-stitching once again. I am glad he is already hanging on the wall.